The Cherokee Delaware Tribe of the Northwest members consist of Native Americans who are of Western Cherokee and Lanai Lanape Delaware Indians descent. 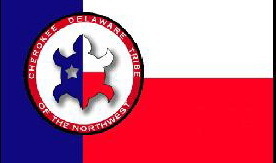 The Cherokee Delaware Tribe of the Northwest was formed in the state of Oregon as a 501C (3) nonprofit corporation. Members of the Tribe are in many different states and as such Bands were formed to facilitate better communication and work towards common goals in the hopes of attaining federal recognition as a Native American tribe. The Tribe has a principal chief, deputy chief, president, tribal secretary, Secretary of State and other officers. Each Band has a Band Chief, Deputy Chief., Speaker of the Band Council, Clan Leaders, i.e. Eagle Clan, Bear Clan, Cougar Clan and Wolf Clan. The Clan names represent each animal and bird in the national flag of the Cherokee Delawares of the Northwest. The flag is shown at www.cherokeedelawaretribe.org.